Peter Schneider, Manager of the Public Lending Right Program and Executive Secretary to the Public Lending Right Commission (The Canada Council), and Heather Menzies chat at the re-opening of the Library and Archives Canada. Photo Credit: Library and Archives Canada. It might be rude when celebrating the Library and Archives of Canada being re-opened as a public cultural space to ask why this matters. But it still might be appropriate, considering how many people get their culture so much more conveniently now at home. It might also be timely to consider what public cultural spaces mean – by remembering and even re-envisioning them as a continuity of historical commons. As I learned when exploring my roots in the Scottish Highlands, the word common, deriving from two Latin words, means ‘together as one.’ For my ancestors, it meant people coming together in mutual self-interest in shared habitat. It involved working out relations with the land for the common good, which at root meant mutual sustainability: the sustainability of habitat and inhabitants both. The culture of the commons was not separate from the economy, but an indivisible part of it: informing it and giving expression to its larger meaning. Common knowledge, or shared knowledge derived from shared experience, observation and discussion, informed such critical economic policies as the setting of limits, called stints. These stints were applied to, for example, the number of cows, sheep and goats any one family could take to the upland pasture, called the shieling, for the summer, to prevent it being over-grazed and destroyed. Ceremonies and invocations attended these seasonal migrations, much as in Ottawa, the Algonquins traditionally performed a tobacco ceremony at the base of the mighty Chaudière Falls before attempting any portage around them. Left to right: Dr. 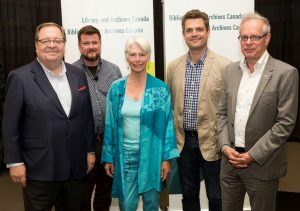 Guy Berthiaume, Library and Archivist of Canada; Peter Schneider, Manager of the Public Lending Right Program (The Canada Council); Heather Menzies; Sean Wilson, Artistic Director, Ottawa International Writers Festival; Simon Brault, Director and CEO for the Canada Council for the Arts. As my ancestors journeyed up Glen Lyon toward the shielings, tradition bearers also led them in songs, like Chi Mi, which means “ I see.” Each verse began with these words, then named some feature of the landscape through which they were passing, followed by a story, an incident associated with that spot. As I hiked to the shieling myself, combining all the academic reading I’d done with walking the land my forbears had inhabited, I tried to imagine my way into what it might have been like: people singing their storied connection to the land and, in the shared singing, renewing it – renewing that shared connection – as part of their identity. The experience enlarged my perspective, allowing me to understand the enduring significance of public culture as commons. People make and re-make public spaces into commons as they come together in shared experience at a kids’ sports event, a concert, a play, a community picnic in a park or an art exhibit. 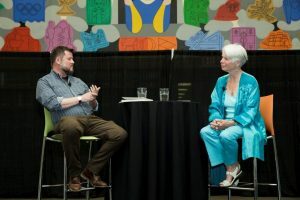 I recall the excitement in the air at the National Gallery and the Art Gallery of Ontario as people shared ‘getting it’ – be it the shape-shifting vision of Norval Morrisseau, the moral courage of Alex Colville or the mystical gaze of Mary Pratt. Some of our newest city libraries (Halifax, Montreal, Vancouver) seem also to evoke the spirit of the commons in their design, with their openness not just to inside-outside flow-through but inside as well – with wide, open staircases and foyers, and coffee shops too, where people can linger, see and be seen and participate in a range of events. Meanwhile, arts-council grants and public-use payment schemes like PLR (Public Lending Right) nurture mutual sustainability: helping creators sustain themselves financially so that the cultural habitat they help enrich can, in turn, sustain its citizen-inhabitants with relevant knowledge and narratives of connection. Besides being repositories of common knowledge, libraries are also offering a range of knowledge-commoning activities – with participatory exhibits, such as the Library and Archives Canada’s “Naming” project, and speakers’ series, such as the “Incite” programming at the Vancouver library and a similar one in Halifax where the narratives and knowledge vested in books and archives is made new through people’s engagement with it. It all keeps the cultural habitat alive: the public realm on which a healthy democracy and the capacity to come together for the common good depend. The legacy of the commons reminds us of what is important in all this: engagement through ongoing relationships and activities in which there’s room for all to participate. There’s a corollary to this that is equally important: the commons model of local self-governance and shared responsibility in project teams. Though Marshall McLuhan’s famous aphorism, ‘the medium is the message,’ has largely been applied to communication media, it applies to any means or medium used for getting things done. That’s why we have ‘arms length’ cultural institutions in Canada. They are not state bureaucracies, nor for-profit businesses. I would hold up the commons as a mirror through which these institutions might usefully see themselves afresh. Heather Menzies is the author of Reclaiming the Commons for the Common Good, and Chair of The Writers Union of Canada. This essay is based on a presentation she gave at the reopening of the Library and Archives Canada to the public on May 25, 2016. This entry was posted in Author, Speaker, Writer and tagged Canada Council, commons, cultural commons, Guy Berthiaume, Heather Menzies, Library and Archives Canada, national library, Peter Schneider, Sean Wilson, Simon Brault by Peter Moore. Bookmark the permalink.